Thought I'd share some photos of my poorly CY 260. I'd just swapped the carb to see if this was the reason for it's poor performance. Started the engine, it ran for about two minutes then cut out and wouldn't restart. Checked for compression to find there was zero, so a strip down was now in order. Soon found out the reason for it not running. A small piece of metal (steel) had entered the engine and got stuck down the side of the piston. I'm not sure where it came from. It's about 2mm-6mm. Wow, thats a nasty gash. How deep do you think it is? I've seen where people take the piston and the head and sand it smooth then use a new ring. Thats assuming that its not too deep. It's probably about 1mm deep, 0.5 on the piston and 0.5 in the cylinder. If it were just the piston then i think it would just clean up and a new ring would sort it, but with the cylinder being scored also then i think this one is resigned to the bin. Got a kingmotors 28.5 piston and cylinder on its way, but unsure if i'm going to fit it yet after reading some posts on here about their quality. I'll make my mind up when it arrives. can you post a few pics of the whole cylinder, maybe in a bit more light. also a couple shots of the case may help determin where this piece came from. full shots of the piston would be good too if possible. this a new motor? i suspect its not as you said you just swapped out the carb as well. mayby check the carb side mount screws to see if a piece of the intake broke out and fell in. you can see by the marks the piece entered up the cylinder thru the transver port. It's an old motor i got with my MCD Baja. It has casting marks dating it about 4 years old but don't know how much use it as had. Will post some more pics later once i've got the kids to bed. From what little I can see of the cylinder sure looks like more then one piece. Looks like quite a few scratches. That little piece of metal that you recovered from your cylinder, that looks like the bottom end of a spark plug! How that would actually break off of a plug, IDK. @46u, i think it's the same piece that has done the damage, just gone up and down the bore in a few different places. @savagejim, definately not the bottom of my plug, that's still intact, it's quite a bit thinner than the plug electrode also. Maybe it was already jammed in the different carb that you swaped over the original with? Then when you opend the throttle it may have been sucked into the engine? 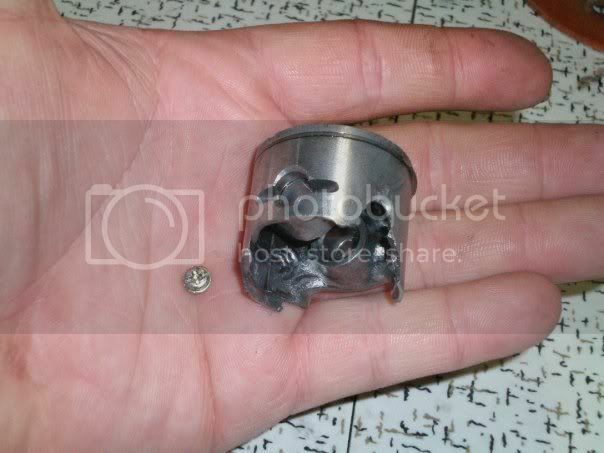 If it came from my carb, then i'm glad it destroyed this motor and not my zenoah in my Marder where i borrowed it from. 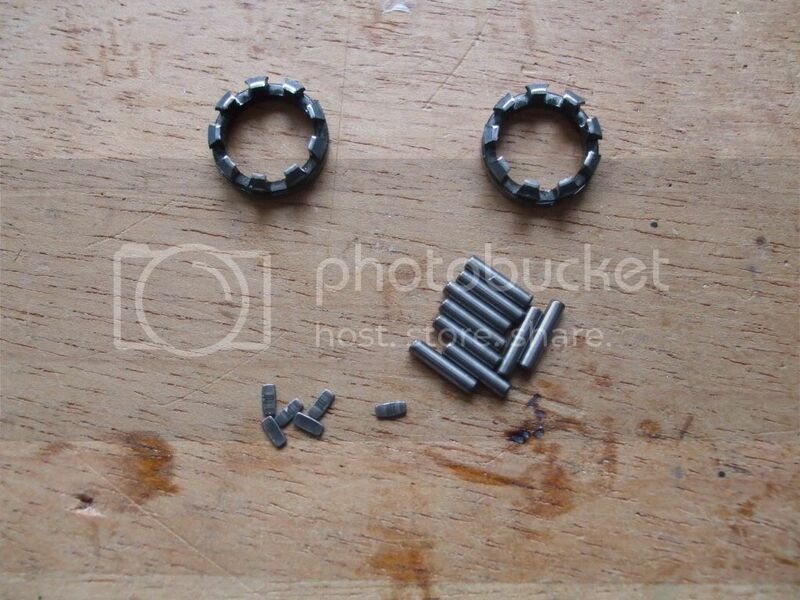 Looks like a part from a bearing race. Check the bearings in the crank case. I had the same problem with a homelite. I went threw two cylindar heads befor I found the bearings were the problem. A bearing shedding parts like that is a bad thing. How many pieces came off of it like that before your noticed that your two cylinder heards were toast? I'm surprised that more stuff inside yiur engine was not ruined. I found out what damaged my engine. It was a peice from the little end bearing. I had something similar happen. My engine sucked in the diaphragm screw from the carb (not tightened well enough?). Tore up the cylinder head pretty good too.